Whether you’re going for a more classic professional look, or a funky trendy vibe most of us in the corporate life, students, and gals and guys alike often need to carry a laptop. It can be hard to find something trendy and affordable, with so many bulky or over-complicated laptop bags on the market. This article provides a list of well rated messenger bags that are functional, yet fashionable for a variety of women and men. Each bag holds up to a 14″ laptop. 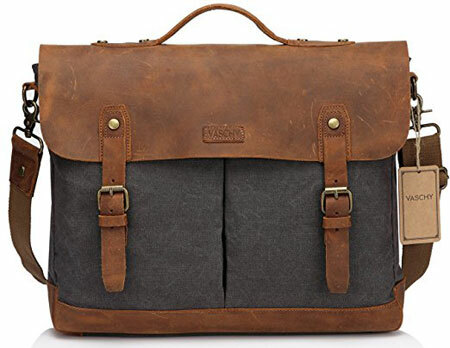 This vintage inspire retro Vaschy Leather Canvas Messenger Bag is an excellent on-trend choice for both guys and gals. 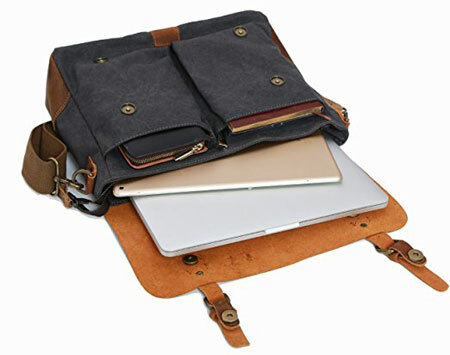 It’s well-crafted from real leather and canvas making it durable for long term use. 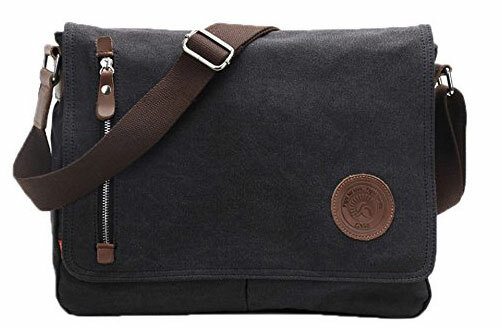 This masculiane military looking messenger bag is made from thick 100% cotton canvas material with vegan leather accents. 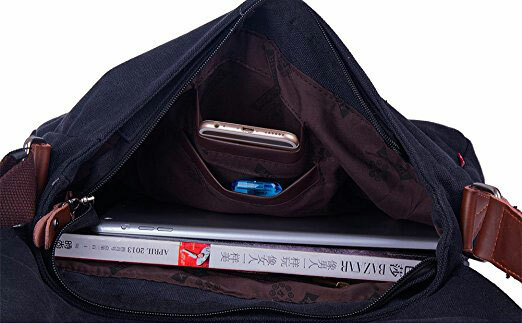 It’s a durable bag that offers protection for laptops and other electronics. Made of thick 100% cotton canvas, vegan leather accents, and metal pieces this a animal friendly and durable bag. It has a rugged look with a masculine metal top zipper. 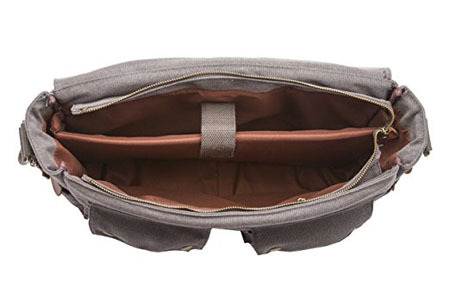 A padded laptop compartment is specially designed to protect laptops up to 15.6 inches. Slide-and-snap front clasps provide quick access to the main compartment. The handle located at the top-rear is great for grab-and-go transport. Additionally the straps are length-adjustable and extra padding is added for added comfort. 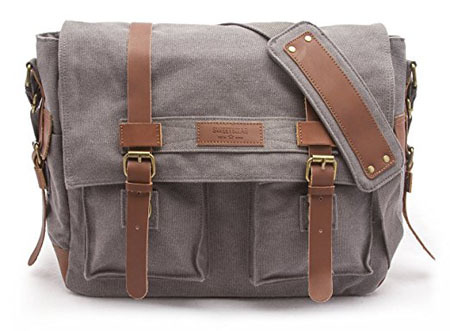 This military style messenger bag is a great travel accessory for day travels, students and laid-back business men. It’s durable cotton material will likely last even with harsher use. With 5 manly color options it has style along with functionality. 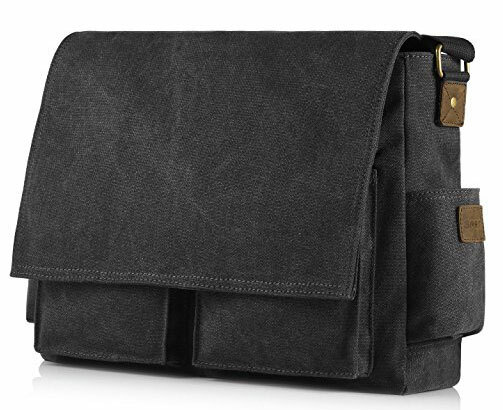 This casual bag messenger bag has a simple straightforward design. The canvas material is waterproof and durable. It’s an excellent travel companion for daily use. 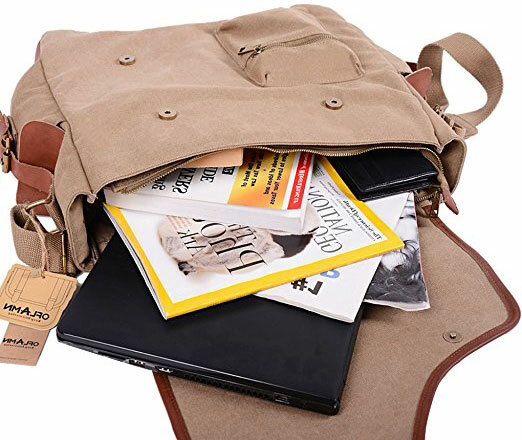 If your the type that’s a little rough on your bags this a great user friendly bag that’s excellent for short traveling, school, daily using and even outdoor travels. The material is a high quality canvas that’s waterproof and durable. Lots of nice pockets are included inside for pens and small objects. There is plenty of space for up to a 14″ laptop, with additional room for notepads and books. It’s equipped with a detachable and adjustable shoulder strap for comfortable wearing. User friendly design and understated style are features of this bag. It’s also affordable at only about $23. This piece comes in black and coffee brown. This sleek bag is stylish and professional looking. Crafted from high density canvas fabric, you’ll get your money’s worth and more. Users rate this bag high for it’s style, functionality and durability. Out of all of the bags in this article I feel like this one it the most professional looking. The clean lines and sleek edges are classy and business appropriate for women and men. High density canvas fabric with crazy horse real cowhide leather trims and soft polyester lining is durable and reliable. The front flap is equipped with magnetic closures that can fold over the zipped main compartment as you like. So this piece really has two looks in one bag. It’s also very spacious with, two roomy side pockets, two front pockets and one zipper back pocket for quick-access accessories. The main compartment can fit up to a 15.6″ laptop. The comfortable shoulder strap with wide pad can be adjusted from both side. Smartly designed for people in motion. I’m a fan of this bag. At only $30 it’s an excellent buy for students, business people and travelers. If you’re look for something a little different, yet classic, this is a vintage inspired bag with a unique look. 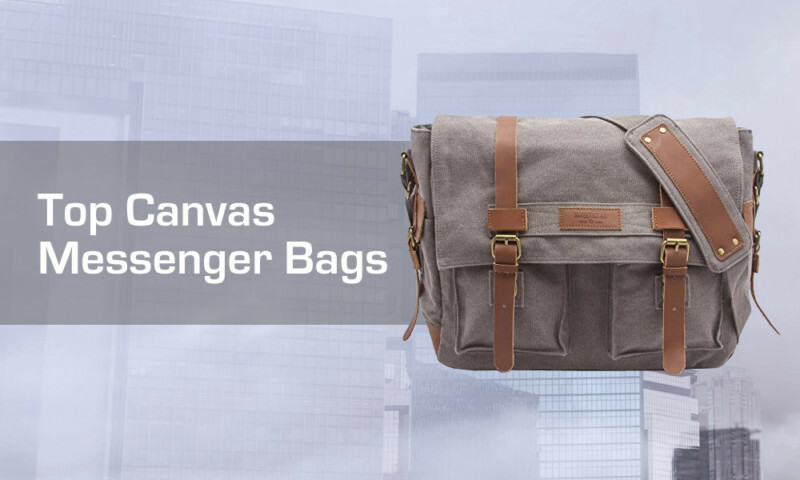 The canvas material is high quality and added padding ensures protection for your bags’ contents. 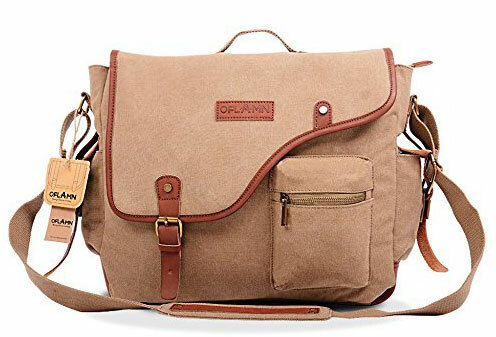 Oflamn will help you bring your messenger into the urban city lifestyle and commute with style. This vintage messenger has a uniquely shaped front flap with added leather accessories. 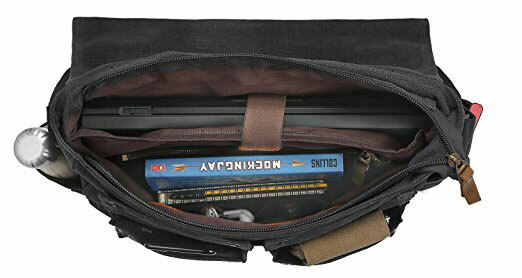 This messenger bag is designed with a padded main compartment that offers laptop protection. The main compartment also contains 1 zipper pocket, and 2 open pockets to keep your essentials organized. the adjustable padded strap promised to reduce shoulder fatigue in daily use. A convenient top handle is also included for handheld use. I also really like how it comes in two sizes, a 14″ and a 15.6″ inch. This bag is on point with it’s trendy vintage style. Interior organization and quality material make it user friendly for gals and guys alike.